Home Wellness	Someone is talking to me…I must look pretty today. I spent the past weekend in Atlanta for the Mom 2.0 conference. Though it was not my first blogging conference, it was the first time I attended this particular event. I have tried to make it work in past years, but due to timing or location it just never came together. This year, I bought my ticket far in advance and went with an “all in” attitude. The first night, however, I became very aware of myself. The welcome reception was a garden party at the most beautiful estate. The location was beautiful, the people were beautiful and I even had my hair done at the Drybar to kick it up a notch. I tried to project my A-game, but inside I was feeling very small. Friday morning, I sat reflecting on the idea of true beauty after spending some time hearing from various industry professionals on the panel. As I sat there, I realized one of the women on the panel was the one who talked to me the night before. I was stunned. I remembered my earlier thought and the truth of my upside-down values were shining at me like a neon sign. Little did I know that I would spend the rest of the weekend opening my heart to the definition of true beauty and value and become so inspired that I was moved to tears. As I sat in the keynote on Friday morning, listening to Jen Bremner from Dove share about their award-winning #BeautyIs initiative to have real conversations about beauty, I knew I was in for an education. I watched painfully honest videos of little girls asking if they are beautiful and I wanted to scream YES. YES YOU ARE! More than you even know! I wanted to scream it. I wanted to hear it. I was sad to realize that inside I am that same little girl asking for that same outward validation. Beautiful is a seductive word. A word with so much power. Use it wisely and you will see women soar. Use it destructively and the effects are just as powerful. At 35 years old, I see beauty everywhere in others. But I am still fighting that struggle within myself, daily taking these destructive thoughts captive. Constantly battling the images of perfection no one prescribed for me. It is a humbling realization. I am surrounded by beautiful people; people who all look different, people who aren’t like me, people who have different talents and gifts, people who truly carry beautiful with them. As I sat on the plane traveling home yesterday, I opened the book Made to Crave in my Kindle app. I love the way author Lysa Terkeurst describes her food journey as a spiritual one. Just as the idea of “beautiful” is seductive, so are the thoughts that come into my head that tell me I am not. The victory is in rejecting these thoughts as the lies they are and replacing them with the truth. How many times do you hang onto the one negative comment you heard about yourself as the truth while brushing off compliments as pity comments? Be honest. Have you ever said, “oh you have to say that, you’re my friend (mom, husband etc. )?” I am so guilty of this it’s embarrassing. After several conversations this weekend, I know I am not alone. It’s time to carry beautiful. 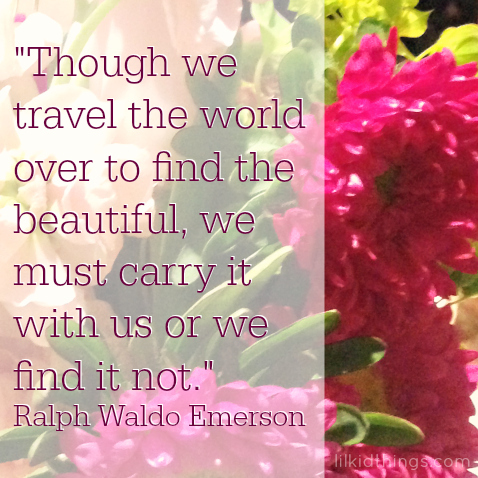 It’s time to put down the old ugly baggage and pick up beautiful. Will you do it? The best part? Beautiful is weightless. Want more posts like this? Be sure to follow me on Facebook. Love this Andrea. Well said. And I’d cross a room (or a runDisney corral!) to hug you any day! Andrea, you are one of the most beautiful people I know. Your beauty shines from the inside out. Your words about the young girls also moved me to tears. Thank you for sharing your beauty and beautiful words with the world. I can’t wait to share this with others!! “Beautiful is weightless”. Love that so much. The weekend was truly amazing. Thank you and I agree. So much goodness! I am struggling with this so much right now. I’m Fadra and I have a problem with myself. Even after hearing the tearful messages, I went right back to my same routine of being critical of every aspect of myself. Just when I think I’ve outgrown it, it rears its head. But I did walk away this weekend resolved to work on it. Yes, this is what I deal with. That is why with each thought I have to ask myself, is this real? Usually the answer is no. I still need so much help in this area. I admit that the all the beauty at Mom 2.0 intimidates me. Somehow while feeling totally inadequate, I realized that I wasn’t comparing my beauty to others this weekend. I was just…seeing it. Everyone was positively shining and I loved it. Oh my beautiful, beautiful friend. You captured the emotion I felt over the weekend so eloquently. I love you. this might be your best post yet…. Yes, I will. Damn, love this! Thank you. Whoa. Andrea, I think you’re a stunning woman, and so I’d never imagine you experiencing such thoughts about yourself. I know we aren’t two people who connect very often (despite proximity) but when we do I see it in you and I envy it sometimes. I mean, I know you’re human, of course, but I always think – wow – stunning and so put together. Amazing how it works. I’ve spent many a therapy session with this battle over my life, and when I think I have it beat it resurfaces, and then there are days I feel my “worst” and it’s not there. I don’t know. I wish we all knew how beautiful we are. And if you need someone to remind you, well, I’m here!